This was used in EP. 420 "You Don't Know Jack". 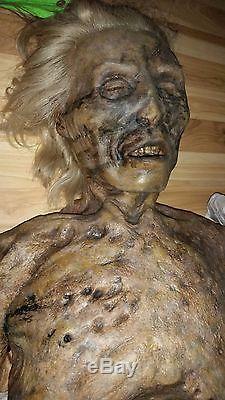 This is Adaline's (main Hexinbeast) mom's corpse CATHERINE.. They dig her up and bring back to the spice shop where they remove here liver for a potion!! During the scene you see the main stars gather around this prop. The cut open chest in close up and remove her liver. "This comes with that liver as well as other extra props for the scene". Rarely you have a prop like this where it is on screen for several minutes and the whole cast is there and reacts handles the prop and also plays a pivotal role in the story!! This was made at one of the top FX studios in Hollywood. It cost thousands to make this!! 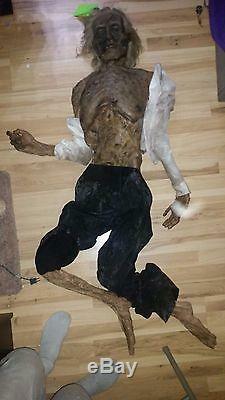 It is a full body corpse made of silicon with a poseable armature inside. She has hand punched hair. That's right, every single hair was punched one at a time. The paint is very realistic and beautifully executed! 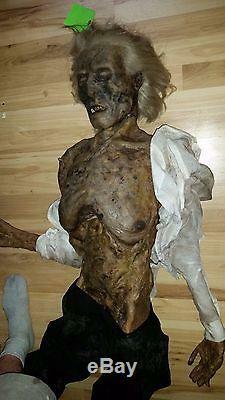 There is a slit in her chest area were the actors cut her open and removed her liver. She comes in a full body bag from production. 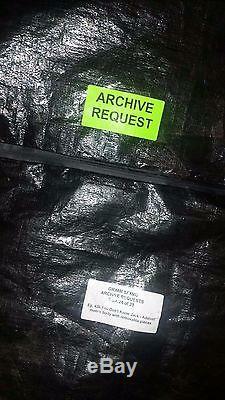 There is a sticker that reads "ARCHIVES REQUEST". Also another that reads "GRIMM SFXMU" ARCHIVES REQUEST BOX 24 OF 29. Also another reads (1st choice for MUSEUM) THATS RIGHT THIS IS STRAIGHT FROM THE GRIMM ARCHIVES AND WAS #1 PICK FOR THEIR MUSEUM. 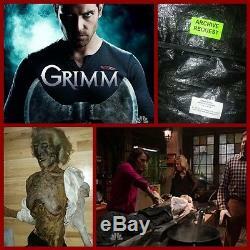 Also there is a bag with that reads "GRIMM SFX MAKEUP DEPARTMENT" with list of extra pieces. 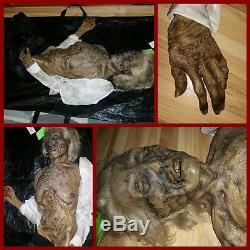 1 So you get a full corpse screen used. 2 comes in GRIMM ARCHIVES bag. 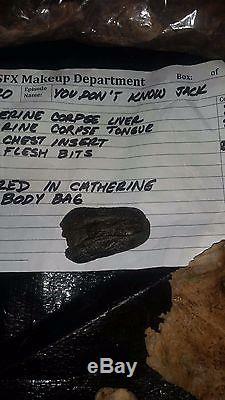 3 bag with extra pieces from fx dept. This is a very rare opportunity to get such a well used prop in many scenes, with such awesome documentation, and extras!!! This is a museum worthy piece in any collection!! PLEASE CHECK OUT OUR OTHER AUCTIONS!!! 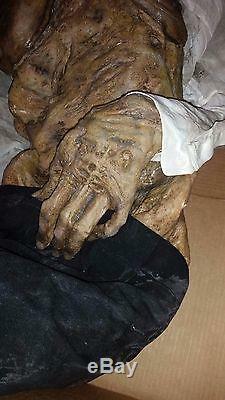 The item "GRIMM screen used corpse zombie horror movie prop Savini FX Halloween haunt" is in sale since Saturday, June 24, 2017. This item is in the category "Entertainment Memorabilia\Movie Memorabilia\Props\Originals".